Infectious laryngotracheitis (ILT) is a highly contagious respiratory disease caused by the Laryngotracheitis virus (LTV), also called Gallid herpesvirus 1. The disease is usually seen in adult chickens and pheasants, over 14 weeks of age. Affected birds develop conjunctivitis, nasal discharge, swollen infraorvital sinus (swelling of the face), and sometimes moist rales. In severe cases, birds might be seen frequently shaking their heads and scattering bloody mucoid material across the environment. How is the virus transmitted to chickens? Exposing unvaccinated flock members to chickens that either received the ILT vaccine or who were previously infected with ILT but had recovered. These chickens serve as carriers of the ILT virus, often shedding the virus in their feces when they are stressed. Improperly burying dead carcasses, making them accessible to wild animals or domestic cats and dogs. 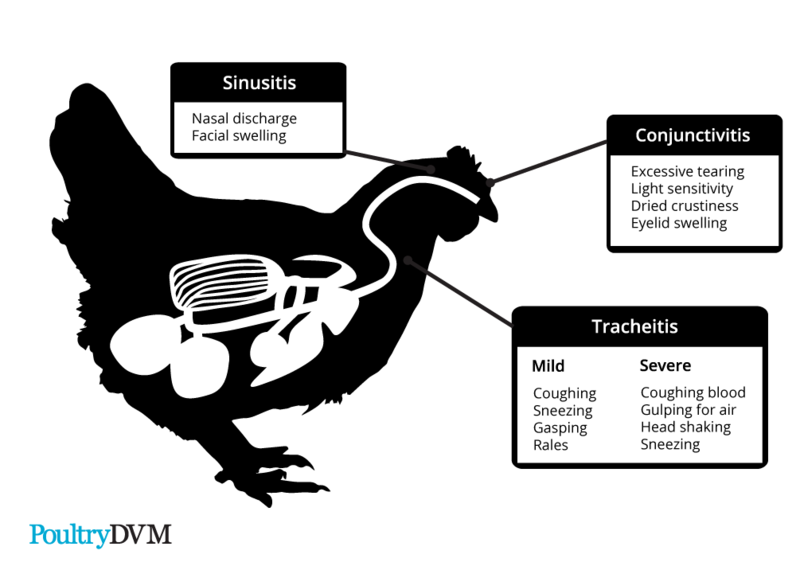 Infected chickens are able to quickly spread the virus to remaining flock members through their respiratory secretions and airborne particles released during sneezing and coughing, as well as by contaminating the environment through shedding the virus in their feces. Some infected birds can become latent and start up again when stressed, sometimes without showing any clinical signs of infection. The incubation period of ILT is 3-14 days. However, 5-12 days is more common. Chickens infected with the virus will become infectious to the other birds from the end of the incubation period and up to 14 days thereafter. Chickens who receive the ILT vaccine are capable of infecting non vaccinated birds with the milder field strain of ILT contained within the vaccine. Vaccinated birds will shed the virus in their feces for up to 14 days following inoculation. How long does the virus survive in the environment? ILT virus can live for 8-10 days in droppings and up to 70 days in carcasses at ambient temperatures of 13-23ºC. The virus lasts longer in the winter due to the cool temperature. The virus may survive for up to 80 days in tracheal exudate (throat exudate) on non-conductive material such as wood if not disturbed. Sunlight, heat and desiccation (drying) are the three natural enemies of the ILT virus. Birds that become infected with ILT carry the disease for life, and may manifest signs of infection when under stress. Diagnosis of ILT is confirmed by ELISA, virus isolation, indirect fluorescent antibody testing, or by histopathology where intranuclear inclusion bodies are found. Detection of LTV antigens in tracheal tissues or respiratory mucus through the use of fluorescent antibody, immunoperoxidase, electron microscopy, DNA hybridization, antigen capture enzyme-linked immunosorbent assay (ELISA) and by Polymerase Chain Reaction (PCR) tests. Therapy for conjunctivitis Signs can often be relieved by applying a warm, damp facecloth to the eyes to help crustiness from forming. Vaccination : Vaccinate all flock members, first with a mild vaccine strain then about 4-6 weeks later with a more virulent vaccine strain. This produces an immunity that lasts at least one year. Molted flocks should be vaccinated again at the end of the molt period. Mixing of birds should only be done when a complete history of the birds is available, and it is absolutely certain that a potential ILT "carrier" is not present. The disease is usually seen in adult chickens and pheasants, over 14 weeks of age. Mixing chickens who received the ILT vaccine with unvaccinated birds. Housing chickens that have previously recovered from a respiratory infection with the flock. Exposure to darkling beetles (little beetles), which have been documented to act as vectors for the ILT virus.